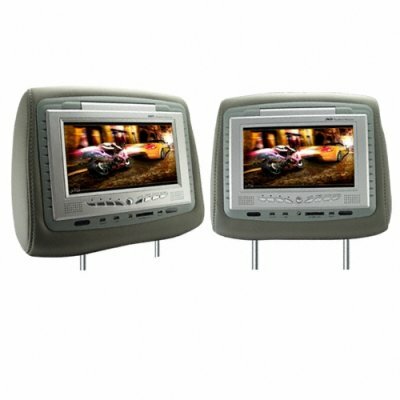 Successfully Added Car Headrest (PAIR) Entertainment Center with DVD + Multi Media to your Shopping Cart. Car headrest entertainment center with DVD player, memory card reader, video games, and digital media playback. With a crisp 7" widescreen (16:9) display and built-in stereo speakers plus headphone jack, this is one car headrest your passengers will be happy to look at during a long drive! This headrest entertainment system plays such a wide range of media types that even the most hard to please passenger will be happy, and since it has an integrated sound system, it can be used independent of you car stereo. This headrest entertainment system has a DVD and CD disc player, MP3 and MP4 players, picture viewer, video game player (with controllers), memory card slot, and even a mini-USB slot for attaching a portable media player so your passenger can play with their own collection of music and videos without worrying about running out of power. Whether you have children or film aficionados in the back seat, everyone will enjoy the features of these headrest, from enjoying movies on the region-free DVD player to the integrated NES ROM video game player system, there is something here for everyone. For easy installation, the headrest has two built-in adjustable width metal struts to fit most car manufacturer standards and the ability to be powered either from the car battery directly or a car cigarette power adapter. A well designed car headrest entertainment center at a direct wholesale price. The CVSI-1208 is now available only from your source for high quality Chinese electronic products, Chinavasion. This headrest entertainment system plays a wide range of disk and media types plus has its own integrated stereo speakers so it can be used independent of the car stereo system. No matter what you're watching, it all looks great on the crisp 7 inch wide screen LCD. A great D.I.Y. addition to any family vehicle. In these tough economic times, why not save some money by doing some DIY work on your car during your next holiday? This car upgrade can be enjoyed by the whole family! Please note this product comes as two pieces (two headrests) in 1 box. If you need a single unit, please consider ordering model CVSA-448.